Citation: TamilKumaran.T,Yasodha.R. (2014).An Efficient Line Drop Noise Removal of System Level Design Model. 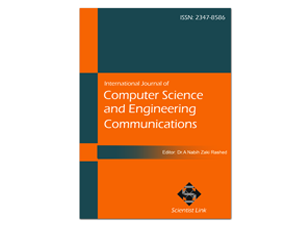 International Journal of Computer Science and Engineering Communications,Vol.2,Issue.3,pp.319-321. The rapid increase in the range and use of electronic imaging justifies attention for systematic design of an image compression and denoising system and for providing the image quality needed in different applications. The basic measure for the performance of an enhancement algorithm is PSNR, defined as a peak signal to noise ratio. In this work, a simple design is implemented for removing noise from gray scale images, that depends on Two Dimensional Discrete Wavelet Transform (2D-DWT) and a threshold stage is proposed. The proposed design is used to remove impulse noise ( the Line Drop Noise) from the corrupted images. This architecture consists of a control unit, a processor unit, two onchip internal memories to speed up system operations, the proposed architecture is designed and synthesized with the Verilog or VHDL language and then implemented on the FPGA Spartan 3 starter kit (XC3S400PQ208) to check validation of the results and performance of the design. Keywords:Image Denoising, Impulse Noise (Line Drop Noise), Impulse Detector, Architecture. Images are often corrupted with noise during acquisition, transmission, and retrieval from storage media. Many dots can be spotted in a Photograph taken with a digital Camera under low lighting conditions. Appearance of dots is due to the real signals getting corrupted by noise (unwanted signals). On loss of reception, random black and white snow-like patterns can be seen on television screens, examples of noise picked up by the television. Noise corrupts both images and videos. The purpose of the denoising algorithm is to remove such noise. Image denoising is needed because a noisy image is not pleasant to view. In addition, some fine details in the image may be confused with the noise or vice-versa. Many image-processing algorithms such as pattern recognition need a clean image to work effectively. Random and uncorrelated noise samples are not compressible. Such concerns underline the importance of denoising in image and video processing. The goal of image denoising is to remove noise by differentiating it from the signal. The wavelet transform’s energy compactness helps greatly in denoising. Energy compactness refers to the fact that most of the signal energy is contained in a few large wavelet coefficients, whereas a small portion of the energy is spread across a large number of small wavelet coefficients. These coefficients represent details as well as high frequency noise in the image. By appropriately thresholding these wavelet coefficients, image denoising is achieved while preserving fine structures in the image. P.E. Ng and K.K. Ma, “A Switching Median Filter with Boundary Discriminative Noise Detection for Extremely Corrupted Images,”IEEE Trans. Image Processing, vol. 15, no. 6, pp. 1506-1516, June 2006. P.-Y. Chen and C.-Y. Lien, “An Efficient Edge-Preserving Algorithm for Removal of Salt-and-Pepper Noise,” IEEE Signal Processing Letters, vol. 15, pp. 833-836, Dec. 2008. S.-C. Hsia, “Parallel VLSI design for a real-time videoimpulse noise-reduction processor,” IEEE Trans. Very Large Scale Integr. (VLSI) Syst., vol. 11, no. 4, pp. 651–658, Aug. 2003. S. Zhang and M. A. Karim, “A new impulse detector for switching median filter,” IEEE Signal Process. Lett., vol. 9, no. 11, pp. 360–363, Nov. 2002. T. Chen and H.R. Wu, “Adaptive Impulse Detection Using Center-Weighted Median Filters,” IEEE Signal Processing Letters, vol. 8, no. 1, pp. 1-3, Jan. 2001. E. Abreu, M. Lightstone, S.K. Mitra, and K. Arakawa, “A New Efficient Approach for the Removal of Impulse Noise from HighlyCorrupted Images,” IEEE Trans. Image Processing, vol. 5, no. 6, pp. 1012-1025, June 1996. T. Sun and Y. Neuvo, “Detail-Preserving Median Based Filters in Image Processing,” Pattern Recognition Letters, vol. 15, pp. 341-347, Apr. 1994. S.-J. Ko and Y.-H. Lee, “Center Weighted Median Filters and Their Applications to Image Enhancement,” IEEE Trans. Circuits Systems, vol. 38, no. 9, pp. 984-993, Sept. 1991. T. Nodes and N. Gallagher, “Median Filters: Some Modifications and Their Properties,” IEEE Trans. Acoustics, Speech, Signal Processing, vol. ASSP-30, no. 5, pp. 739-746, Oct. 1982.